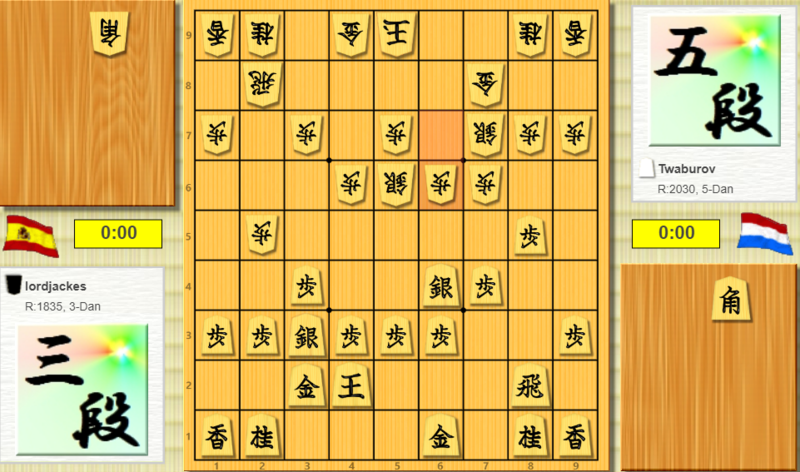 The Netherlands have finished the World Shogi League season well with 7 won matches out of 9 in the B division. We are on the first place currently, but Denmark could still pass us if they win their remaining games. In the last round we beat Spain with 2-1. Daniel Arús took the lead for Spain by beating Ritchy Höhne. Daniel used his Gold to control the advancing Pawn, while Ritchy protected it with B86. Now Daniel blocked the Rook by dropping a pawn on 66. He then proceeded with taking the Pawn on 64. Ritchy sacrificed his Bishop for the Gold, but Daniel’s attack was quicker. On board 2 there was an exciting battle between Wouter de Haas and our Spanish friend Jona Ruiz. Jona was succesful on the second file, but Wouter shifted the focus to the centre. In this position the counter attack of Wouter is already quite strong. 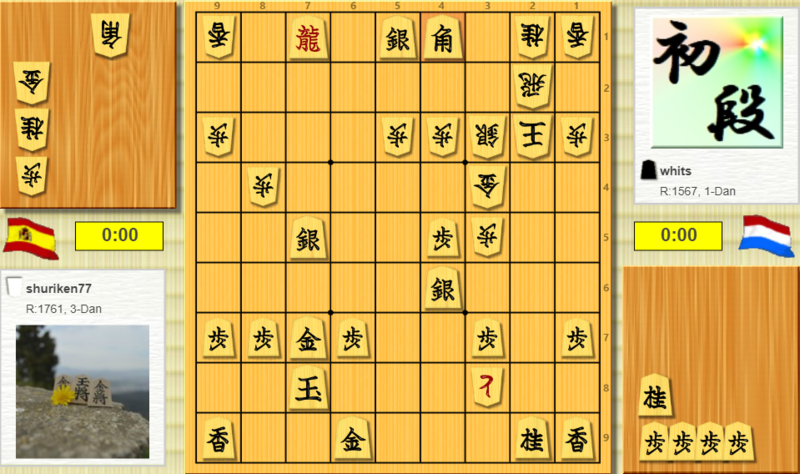 He showed an interesting concept here by playing B55. 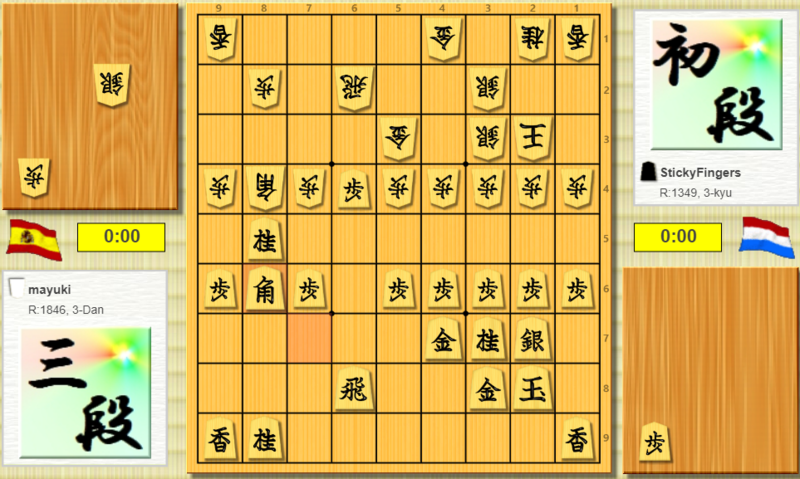 Now, he threatens Px73 Gx73 P*74, while the Bishop cannot be taken. so the pressure on the diagonal is very strong. Jona answered S63, and after S*75 Sx54 Px73 Gx73 Bx73+ Kx73 Rx54 the Bishop has been exchanged for two Generals and Jona’s King is very open. However, he managed to run away. Wouter had been chasing the King, but now Jona chose the wrong route. I think after K24 it would have been very difficult to catch the King, and Jona would have a good chance for an entering King. However, he went to 12 with his King and this gave Wouter a chance to continue his attack with P*23. After Rx23 +R72 P*22 N15 Rx29+ P*23 Wouter got a very strong pressure on the second rank. In fact this pressure is very similar to the one in the previous position with the Bishop’s diagonal. 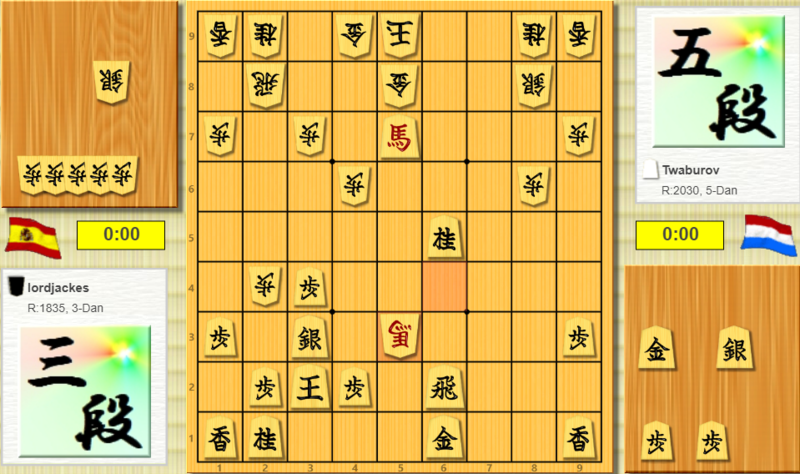 Also in this position, he kept pressuring with successive Pawn drops, this time on 23. Wouter won a lot of material, and mate followed soon. So the decisive game was between me and Diego Gonzalez. 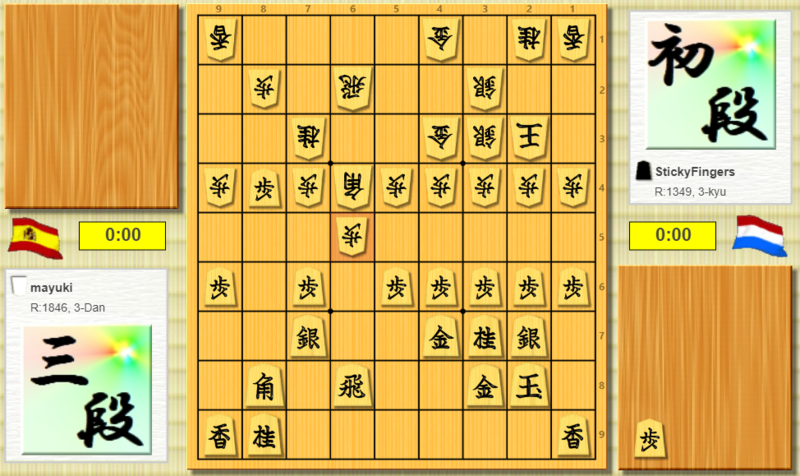 Note that he has a nice blog about Shogi! As usual, I prepared for my opponent, and saw that he was playing Static Rook and often did an early Bishop Exchange, even when he would lose his turn to move. Being very familiar with a type of position can certainly be more important than one move in the opening. However, I made sure that I was ready for this type of position too, and analyzed it a bit with the engine. I saw that the engine would often go for Rapid Advancing Silver in Bishop Exchange. 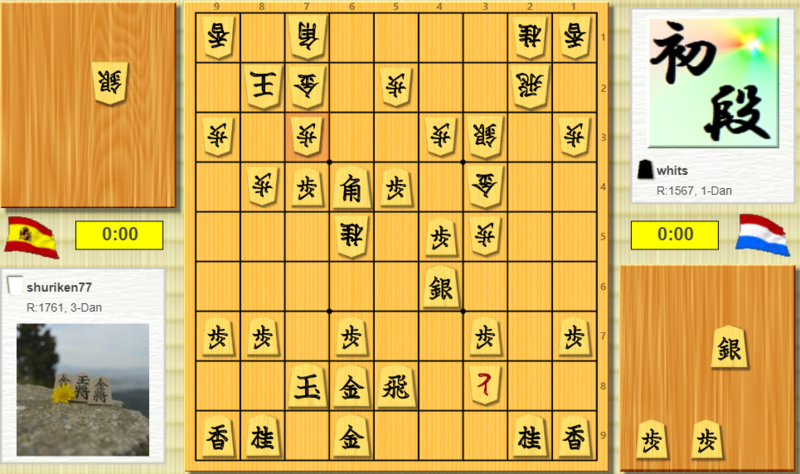 And that the position would be quite playable, even when the opponent goes for Reclining Silver, which is the best countermeasure according to the video of Hidetch. So I decided to analyze it a bit and go for it, I liked also the directness of this variation. In my preparation I saw that P75 sometimes needs to be prepared by K31 first, to protect the Knight. We will soon see why. However I also saw that in some positions this is not necessary. I felt that his shape was not ideal, with a sitting King, so I decided to go for it. After P75 Px75 Sx75 P24 Px24 P*25 his idea is that I cannot take on 25 because Rx25 would be a Silver-Knight fork. So I continued my attack with P*76 S88 Sx66 Px24 P*22 and accepted the situation on the second file. This situation is pleasant for him, and later he could drop something on 23 to break through. However I have also been succesful on the other side, and the result of the opening is an advantage for me. A few moves later the tables started to turn and his attack was very unpleasant. 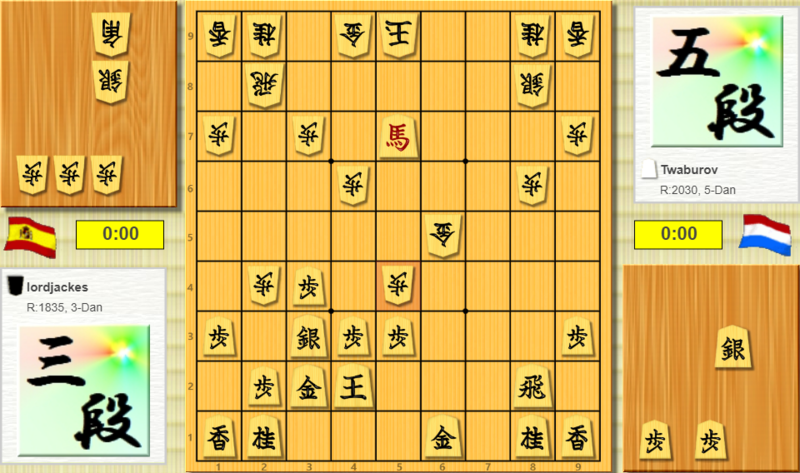 It is not really possible to remove the threatemate, so I tried to mate my opponent. I started with Px58+ Rx58 G*48, exchanging the Rook, his last defender. After Rx48 +Bx48 Kx48 there are a few ways to win the Horse on 53 and escape to his threatmate, but it would not be comfortable to let him attack with many pieces with my King still in danger. So I tried to find a mate and find one after N57+. After Kx57 R*67 we again see that the Rook on 62 supports very nicely in the attack. After K56 I had to find the last important move: G*55. Now Kx55 +R65 K44 S*35 Kx34 G*24 resulted in mate by dropping my last piece! So the Netherlands finished the league in high spirits with 19 wins out of 27 games. In fact The Netherlands is the first and only one to finish all their games in 2017! Hopefully WSL will continued with a few different regulations, possibly with The Netherlands in the highest division!